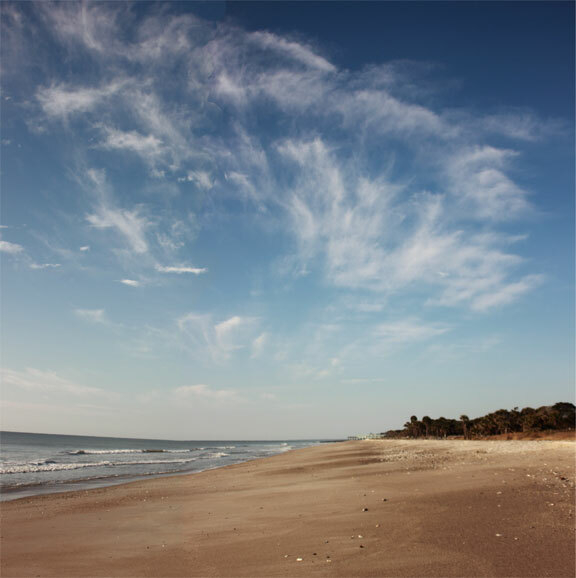 On Wednesday afternoon, my dog Minna and I, took a brisk walk on Edisto (e-DIS-toe) beach. Off to the west high faint, wispy, fast-moving clouds were a unique sight because nothing really moves very fast in South Carolina. “Ceptin’ mebbe a white-tailed deer, or feral cat on the prowl”. My eyes were drawn to the phenomena just the same. Although the sky was mostly clear blue, the clouds slid along like gossamer on the wind, strange I thought. All the comforts of vacation, sun, pillow, undisturbed nap. We returned from our walk and Minna settled down for a nap in her viewing spot by the front jalousie window and I sat down beside her on our all-purpose bench and cranked up my Macbook Pro. The sky darkened as the sun set leaving orange streaks till last light. The temperature was definitely dropping. The acrid smell of cedar campfires wifted in through Luciee’s cracks and crannies, and I began studying about making movies for my blog. Before long I noticed the wind had picked up, my sidekick tent began rattling and puffing like a sailboat, we were definitely in for a blow. I went online and the WeatherEye was predicting strong winds gusts 30-40 mph, cold temperatures throughout the night into Thursday maybe till noon or longer. I got up and located my flash light and some bungee cords. Sit tight and see what happens, I thought. Pretty cold out there now. Writing flows out of me slowly and I often lose track of time. Screened porch beside Miss Luciee. About 10:30 P.M the wind was strong and I needed to barricade the bottom of the door with some rugs and hang a beach towel from the upper casement to keep the cold air from blowing inside. My stocking feet were ice cold, our heater was puffing along and Miss Minna began to snuggle against me away from the window slats. At midnight there was a loud clamor outside. I opened the door and saw right away that the EZ-up show tent had moved and was fluttering about with one leg off the ground. With bungee cords in hand and my down parka on, I ventured out to bungee things down. No bungee cord would do it—this was practically a gale but without the rain. It was a huge wind storm, frigid fingers groped with too tight knots. The brace on my hand was like a funnel for the unmerciful cold wind. Despite all of this it was a fantastic starry, starry midnight blue night sky. I confess that at that moment thoughts of my solid brick home on Barn Stall Lane in Southgate came to mind. I pulled my canvas carryall bag from the back of the truck. Hmmm, I’ve got ropes, in this wind no stakes will hold this tent down. I turned the truck around backing into the space at the other side of the tent from the trailer. The truck would offer protection from the wind and something heavy to tie onto. Tree leaves slapped my face as I rushed to tie down. Tying the back corner next to the trailer, firmly to the trailer frame, I proceeded to the opposite corner with tree leaves slapping and blowing in my face, tying it to the back of the truck, then to the next tying it to the front. The doorway side had to be tied to the campsite-provided, heavy steel grille. 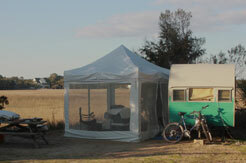 The tent virtually was compelled to remain at an angle like an open jaw, so the trailer door would clear the roof, and could open and close freely. The extra tent top I carried that fit over the EZ-up manufacturer’s canvas provided sure protection from rain and was like a giant cap that held everything in place from the top of the tent with straps tied to ropes to trailer and truck. Well, you know, I could go on and on but suffice to say that Minna and I rocked-round the clock. I got up three times in the night attempting to tighten the guy lines but with a brace on my right hand and the bitter wind blowing I couldn’t hold the tent and untie stretched knots. While the trailer rattled and shook and the flapping tent added a nightmarish quality to this escapade about 3:30 A.M. I made the decision all that could be done had been and it was up to a higher power what the outcome would be. In the black of the night as we rocked I would occasionally hear that last crash that meant the tent was headed for the next county but resolved that I was better off not standing in front of the crashing plane so to speak. After dawn I awoke for the 300th time and peeked. It was still there. By golly didn’t look too much worse for wear either. After lunch I had to move the truck to go to the store for supplies. I dragged the picnic table into its place. The wind was still howling and the tent was walking again. I walked around and surveyed the tent top—it was like a baseball cap on sideways. I removed the screen walls that were offering wind resistance, tied down the tent frame and took the top cap off. Struggling in the wind I stuffed it in the truck like: “up the chimbly the Grinch stuffed the tree.” Turning around I could see my tent-frame tie-down was slacking I ran and tugged it loose and unbelievably the tent took off like a hang glider. Whooooosh! I held on tight, grabbed the metal frame—up, up, on top of the truck dragging me up too. Over we went. Miss Minna ran clear and I let go remaining on top of the truck. BAM the tent landed top down on the other side in the dirt and ground one leg into my new plastic pickup-cap back window for good measure. AIYIYIIIII Amigo, what a ride! In the next few minutes I popped the leg buttons and folded her down to a five foot high stack and shoved her—also like a tree—into the truck. Some parts were bent. Some still are. As I recall some words were said about my truck being a tent hearse. The tent is still in the truck. Thank you very much to all my readers for staying up with me all through the night and riding the ride! Hope you enjoyed it. Wow! You have adventures without even leaving your campsite! This is a great blog. Full of colorful stories, wonderful insights, and beautiful original photography. getting cold just imagining that night! all is well in southgate! were having the wettest winter i recall , awoke to snow again (was pretty while it lasted) will email you soon with info about promoting a blog. Until next time…have a warm relaxing night! Hey neighbor! I found your blog, and what a wonderful site it is!! I am really enjoying “traveling” with you. Your writing is wonderful and as always, your photography-beautiful. What an awful night you had…but it will look great on the big screen if you ever make a movie of this journey! We miss you and Minna here in Southgate. Take care and have fun! Well, Wheelie, you sucked me right in with the JD lyrics in the title and I knew I was in for a ride. Wowsa!!! That adventure sounds just a little more than exciting. Weren’t you supposed to be following the *warmth*? Yeah yeah, there doesn’t seem to be any in the normal places for sure! My friend in Orlanda says she saw her first spider in her house so winter is over there. Winter = zero spiders. Happy Valentine’s Day to one of my favorite Valentines. Lacee and I are snooping around this site every day. Looking forward to hearing about your journeys! Hang Gliding with a tent, new concept for campers. Enjoy your wit, your down to earth writing. I’ve read most everything on your blog and I think you have a book in the making. Good Luck I am joining your club.